The Session this month deals with distance travelled to drink good beer. This is not an entry on that subject...I may or may not get around to actually contributing on this topic this month, but that will be keeping with my past trend. I'll have to see how the rest of the day goes. In the meantime, the subject has reminded me just how good my local beer scene is here in Southeastern Pennsylvania, whether for homegrown beer or for worldly beer selection. Teresa's Next Door, for example, is not usually more than 20 minutes from my home. But, in less time, I can be to Sly Fox, Victory, Iron Hill, TJs, The Drafting Room, the Flying Pig, or a dozen other quality beer bars/takeout. So, I get to Teresa's Next Door much less frequently than I would like. (I know, things are tough in Bryan's world!) 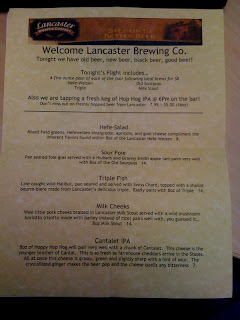 Last night, Patty and I popped in on TND for their promotional night with Lancaster Brewing Company from---wait for it---Lancaster, PA. Brewer Christian Heim made the trip in to discuss the Hefeweizen, Triple, and Milk Stout that they were pouring from sixtels. The last time I saw Christian, he was onboard an Amtrak train with Woody Chandler heading westward after a PBW night in Philly. Christian made it out of Lancaster this time without Woody, very clever (and wise?) of him...something about a moving project. Even more intriguing, though, was a fresh firkin of Hop Hog IPA sitting atop the far end of the bar and a 10-year-old sixtel of Old Sourpuss, something that has whiled its time away aging (or whatever you call it after 10 years!) at Lancaster Brewing. The rising and falling temperatures in the attic have not been too unkind to this beer, though I'd be interested to know what it tasted like 7-10 years ago. Whatever remains of it apparently makes random appearances when the occasion calls for it. I found the Old Sourpuss to be a slightly tart, not too difficult to drink, lambic-oriented beer. The smell was more striking than the taste, with apple- and vinegar-like aromas in a not off-putting display. The flavor, though, was much more subdued than the aroma would have suggested, but to me that made it only more drinkable in that regard. Here comes the special part of the evening: The food. I've been to TND enough times to say that I'm not a stranger. It's these sorts of events, though, that I haven't typically taken in. Come to think of it, the last "event" at TND that I attended might well have been the Breakfast with KBS...in 2008. I make a habit of popping in for a quick beer or two from their always stellar draft and bottle list whenever I'm in the area. And, even though I've eaten enough off of the menu as well, I wasn't aware that Andy and company put so much thought into food and beer pairings during these special events, too (see the list pictured above). Take, for example, the picture below. Ordering the Milk Cheeks, I sure got my barley fill for the evening...but, wow!...this was one of the most memorable dishes I've had since...ah, it's not worth trying to compare. The substantial dish of barley, wild mushrooms (have I mentioned my love of these earthy delights? 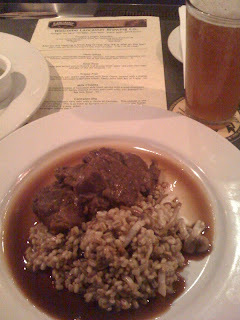 ), broth, tender and meaty pork made for a dish that paired well with the Milk Stout as they suggested. But, it also played nicely with the IPA. I didn't consider pairing it with the Old Sourpuss and that's probably okay, ha. TND does put in a great effort with their pairings. The cheddar cheese, ginger candy and Hop Hog complimented each other quite well. First time trying Lancaster's beers. Christian introduced the beers enthusiastically. The Triple was fantastic and the Wheat had a grainy quality that was also enjoyable.